Hit the open road on a motorcycle inspired road legal mobility scooter. This stylish 3 wheeled mobility scooter is inspired by some of the leading designs in the motorcycle industry. Moving away from traditional mobility scooter design, it creates an exciting and desirable driving experience for elderly users. The Sport Rider is Class 3, 8mph disability scooter that includes all the tried and tested benefits of the Drive range. This easy to operate vehicle provides state of the art performance and will give years of dependable service. Using technology borrowed from the automotive industry the all round suspension provides excellent ride quality and handling, making a cruise on the Sport Rider both exhilarating and comfortable. 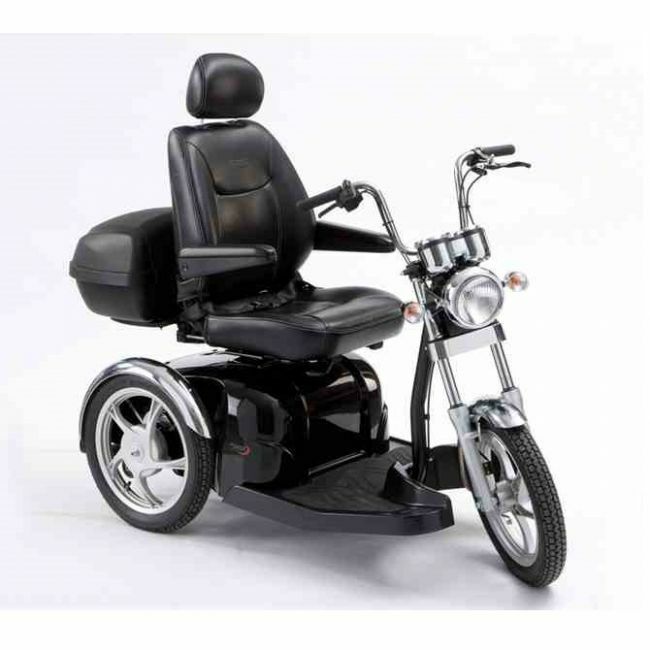 Features include a comfortable sport seat with sliding and reclining facility, adjustable speed settings, motorbike style wheels with chrome mud guards, twin dial digital dash, fully automatic “Self Diagnostic” fault-finding system, height adjustable headrest, large accommodating footwell with anti slip rubber mat, additional hand brake, key ignition for security, rear bumper for additional protection, anti tip wheels, width adjustable armrests, large seat back storage pocket.